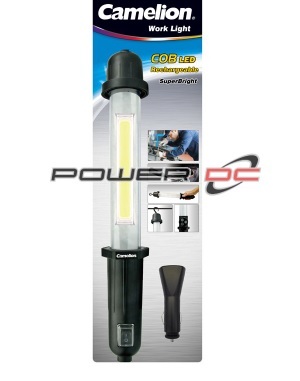 The CAMELION Rechargeable Work Light is a powerful 3W COB LED. It has a built in rechargeable Lithium-ion battery and comes with the universal DC 5V USB rechargeable cable. It also has a strong magnetic button and a 360 degree swivel hook. DC5V - 2A 1.5hrs Approx. DC5V - 1A 2.5hrs Approx. DC5V - 0.5A 4hrs Approx.